Every business has an IT requirement of some description these days, whether it’s for managing broadband connectivity, supporting with IT and software queries, sourcing and installing new computer hardware or managing system and data security to name just a few. At Bongo IT, we’re changing the way that IT products and services are provided. We provide a wide range of straight talking, simple IT solutions and responsive support for our customers, with a straight forward, value based and transparent pricing structure. You could be looking for a solution for managing your emails and file sharing, reducing the cost of your telephone calls, faster and more reliable broadband, hosting for your website or best advice and consultancy on your IT and data protection strategies. 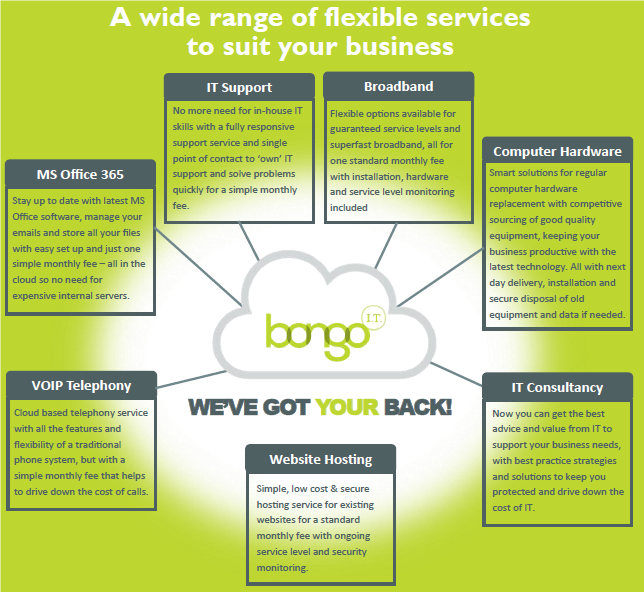 Whatever you need, Bongo IT provide a single point of contact and flexible options for all things IT to suit your individual requirements.